In the case of insulation systems, the phrase out of sight, out of mind, often applies. Most commercial insulation work and many industrial insulation systems are hard to access or are hidden in walls, ceiling areas, or spaces that are seldom seen. These rarely seen insulation systems are designed to perform quietly for many years with little maintenance, so they are often left uninspected until a major problem occurs. For most applications operating at above-ambient temperatures (especially indoors), maintenance is very minimal. Routine maintenance is more necessary for insulation systems that are outdoors and exposed to weather damage, or indoor systems that may encounter damage from personnel. The case for maintenance comes down to a simple analysis of the cost of energy saved or lost versus the cost of the repair. Maintenance can also be required to prevent a safety issue, (e.g., burn protection). In this case, repairs must be made immediately. 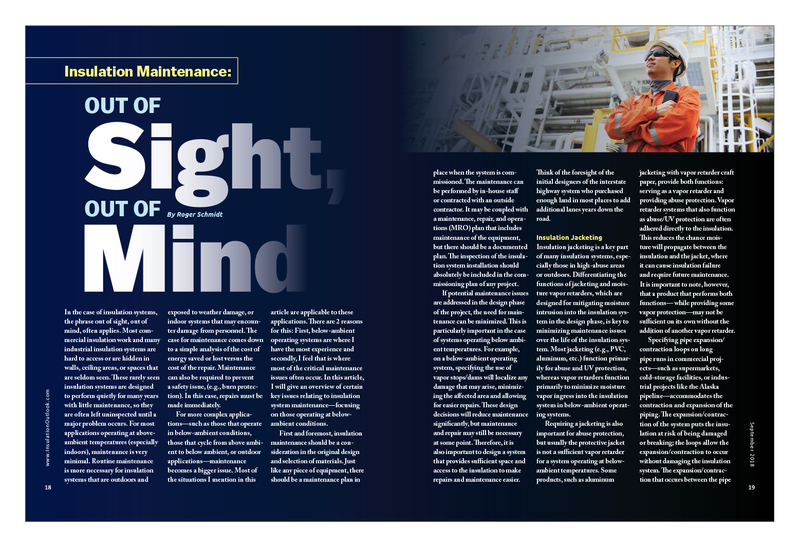 For more complex applications—such as those that operate in below-ambient conditions, those that cycle from above ambient to below ambient, or outdoor applications—maintenance becomes a bigger issue. Most of the situations I mention in this article are applicable to these applications. There are 2 reasons for this: First, below-ambient operating systems are where I have the most experience and secondly, I feel that is where most of the critical maintenance issues often occur. 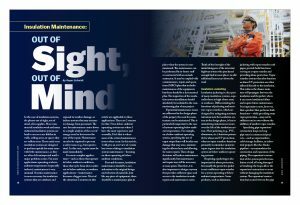 In this article, I will give an overview of certain key issues relating to insulation system maintenance—focusing on those operating at below-ambient conditions. First and foremost, insulation maintenance should be a consideration in the original design and selection of materials. Just like any piece of equipment, there should be a maintenance plan in place when the system is commissioned. The maintenance can be performed by in-house staff or contracted with an outside contractor. It may be coupled with a maintenance, repair, and operations (MRO) plan that includes maintenance of the equipment, but there should be a documented plan. The inspection of the insulation system installation should absolutely be included in the commissioning plan of any project. If potential maintenance issues are addressed in the design phase of the project, the need for maintenance can be minimized. This is particularly important in the case of systems operating below ambient temperatures. For example, on a below-ambient operating system, specifying the use of vapor stops/dams will localize any damage that may arise, minimizing the affected area and allowing for easier repairs. These design decisions will reduce maintenance significantly, but maintenance and repair may still be necessary at some point. Therefore, it is also important to design a system that provides sufficient space and access to the insulation to make repairs and maintenance easier. Think of the foresight of the initial designers of the interstate highway system who purchased enough land in most places to add additional lanes years down the road. Insulation jacketing is a key part of many insulation systems, especially those in high-abuse areas or outdoors. Differentiating the functions of jacketing and moisture vapor retarders, which are designed for mitigating moisture intrusion into the insulation system in the design phase, is key to minimizing maintenance issues over the life of the insulation system. Most jacketing (e.g., PVC, aluminum, etc.) function primarily for abuse and UV protection, whereas vapor retarders function primarily to minimize moisture vapor ingress into the insulation system in below-ambient operating systems. Requiring a jacketing is also important for abuse protection, but usually the protective jacket is not a sufficient vapor retarder for a system operating at below-ambient temperatures. Some products, such as aluminum jacketing with vapor retarder craft paper, provide both functions: serving as a vapor retarder and providing abuse protection. Vapor retarder systems that also function as abuse/UV protection are often adhered directly to the insulation. This reduces the chance moisture will propagate between the insulation and the jacket, where it can cause insulation failure and require future maintenance. It is important to note, however, that a product that performs both functions— while providing some vapor protection—may not be sufficient on its own without the addition of another vapor retarder. Specifying pipe expansion/contraction loops on long pipe runs in commercial projects—such as supermarkets, cold-storage facilities, or industrial projects like the Alaska pipeline—accommodates the contraction and expansion of the piping. The expansion/contraction of the system puts the insulation at risk of being damaged or breaking; the loops allow the expansion/contraction to occur without damaging the insulation system. The expansion/contraction that occurs between the pipe and the insulation system may also require the use of expansion/contraction joints at the proper intervals to prevent damage to the insulation. Selecting the correct materials, including jacketing for the environmental conditions the system will encounter, will also lessen the need for repairs. The maintenance capabilities/facility owner’s expectations should match the design of the insulation system. There are always choices of materials and system design (good, better, best) and the facility owner’s expectations should be considered when selecting materials and designing the insulation system. The old saying, pay me now or pay me later, comes to mind. Using a mastic for abuse resistance or coating for UV protection may be less expensive up front than using aluminum or PVC jacketing, but the jacket will not require routine maintenance like the mastic or coating. In the final cost analysis, the jacket may prove to be less expensive and better meet the facility owner’s expectations for the insulation system. On commercial projects, most repairs to the insulation system in the first year are likely due to poor initial design: an improper selection of environmental conditions upon which the insulation thickness is based, poor installation practices, or damage to the insulation system by other trades during construction. These become apparent quickly and should be resolved as soon as they arise or are discovered during the first year of operation. Four of the most prevalent issues that will require repair/remediation in the first year are insufficient space (between pipes, walls, or through cutouts) for the required insulation thickness, the aforementioned damage done by other trades after the insulation has been installed, open seams, and completely uninsulated areas. Another common cause of damage is installing insulation in a building that is not weather tight. Coastal areas that often get heavy rains in the afternoon are notorious for this. If a building is not sealed off from weather, rain can travel through any opening—such as insulated vertical piping that has not been sealed off—and damage the insulation. On cold operating systems, the design must obviously allow space for the proper insulation thickness, but should also allow space for air movement around the insulated piping—this is particularly important on cold operating systems. Before the areas are jacketed or enclosed, it is worthwhile to give extra attention and inspection to more complex areas that require insulation (e.g., fittings, valves, pipe hangers, etc.). When dealing with cold-operating systems where seam integrity is essential, the use of pre-fabricated insulation sections may be beneficial. These insulations are produced in a shop or factory under ideal conditions, and help ensure tight seams and better performance. Use of removable covers and inspection ports will allow less maintenance in areas that require frequent access. Periodic inspection of the job site during the installation process and a thorough inspection at completion of the process should allow for immediate repairs, lessening the chance of issues that require maintenance down the road. While normal wear and tear may result in the need for repairs, these will generally be minimal. Unexpected events caused by mechanical damage, such as foot traffic, forklifts, water damage, vermin, or severe weather such as hurricanes or hail, can also result in the need for repairs. These types of damage are more typical in industrial applications. In the case of these types of repairs, an emergency triage kit, which would include small sections of insulation of the same type, pipe size, and thickness as what is already installed; insulation tape; vapor retarder (preferably a peel-and-stick type); adhesive; general purpose sealant; and jacketing can be used to make a quick repair until a more permanent solution can be found. Again, this would be most important for a cold-operating system where timely repairs are mandatory to prevent a small problem from becoming a large (and expensive) one. Moisture intrusion can begin immediately, and won’t stop until the point of intrusion is sealed. It needs to be done as quickly as possible to prevent further damage. An experienced insulation contractor should be enlisted as soon as possible to make any necessary permanent repairs. Planned events such as a remodel or revision in the operating systems may result in the piping having to be reinsulated. Reinsulating the areas affected should be scheduled as part of the piping revision. This is often a good time to reassess the insulation in place, and instead of simply replacing it, determine if the market has made advances that could benefit your system. In most cases, the insulation thickness was determined based on a cost-effective approach; with the increase in the cost of energy, it may be a good time to review the thickness specified or to assess new code changes. We have all seen studies showing the quick payback on hot systems for maintenance/repair projects based on energy savings. Immediate attention is usually given to damaged insulation that may result in a potential safety issue, like burns. On the other hand, valves or elbows that are left uninsulated after some type of damage or revision to the operating system are usually easy to justify on a cost-savings basis, but are often left unattended for years, particularly on a hot system. Reasons given for delays often involve the length of time for shutdown to make the repair, bigger capital projects taking precedence, access problems, etc. These type of repair projects may require more planning/timing to help justify them. Because of the issues associated with condensation/frost formation on cold-operating systems, repairs on these systems are more often made in a timely manner because of safety concerns and the potential for greater damage if left unrepaired, or appearance considerations. On cold applications, problems will not go away, and the situation gets worse every day the damage goes unrepaired. Whether the cause of the damage to the insulation system is an unexpected event or a planned event, repairing the damage in a timely manner is critical, especially in a cold-operating system. An official maintenance/inspection plan can often detect an issue before it becomes a major problem and a costlier repair is required. Making the repairs in a timely manner will pay big dividends by reducing down time, equipment damage, corrosion under insulation (CUI), or health and safety issues. The decision to make repairs to an insulation system is more than making a cost analysis based on energy savings. Considering maintenance in the original design of the insulation system will minimize the repairs required during the life of the project. Companies that are really concerned about the quality of their product tend to maintain and repair their equipment, as well as the insulation system, in a timely manner because they know it will affect their end product. General housekeeping/cleanliness are good indicators of a manufacturing operation that is concerned with the quality of their product and not just the bottom line. The most effective dollars spent on maintenance are those spent on preventive maintenance. Preventive maintenance starts with the design and installation and ends with periodic inspections and timely repairs before a small problem becomes a major issue. A final note of caution when considering material selection and maintenance issues: Be wary of insulation products that claim to last forever with no maintenance or boast performance that is unrealistic. Instead, rely on proven engineering design as outlined in various industry documents like the ASHRAE Handbooks, quality materials from proven suppliers, proper installation by experienced contractors, inspection, and common sense.